Santa Claus is coming to your town! 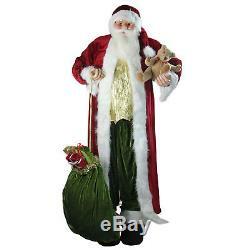 This huge Santa evokes an Old World feel with his red and white, ankle length robe & hat, green pants and gold shimmering vest. This Santa will be the perfect addition to your holiday or Christmas party decor. Dimensions: 6'H x 35"W x 17"D Material(s): fabric/plastic/metal/nylon/faux fur. 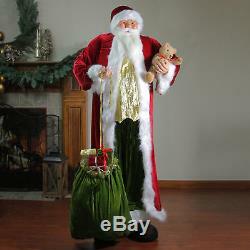 Huge 6' Life-Size Standing Decorative Plush Christmas Santa Claus Figure with Teddy Bear & Gift Bag. Christmas Central provides one of the largest online selections of Christmas decorations, home decor and outdoor living items. We offer everything from the smallest ornament to the tallest artificial Christmas tree and everything in between. But we are more than just Christmas! We offer all holiday decorations in addition to indoor and outdoor decor and everything you need to decorate your home. As a division of the family-owned and operated Gordon Companies Inc, we have 40 years of experience as a retailer. Christmas Central is not responsible if you do not select all the items in your cart. However, you do have the option to sign up for one of the following carrier programs. THIRD PARTIES We will not disclose your personal information to any third party, except to the extent necessary to provide you with a requested service i. Can I cancel my order? Unfortunately once an order is placed we cannot cancel the order. Can I return my order? Merchandise must be in unused condition including all hardware, instructions, any accessories that may have come with the item and is in its original packaging. Re in need of a label please contact a Christmas Central representative. You will be responsible for printing out the label and taking the package to a UPS drop off location. How does store credit work? Do I have to include any paper work with my return? Generally return processing takes 2-3 weeks, during peak holiday season it may take longer. What if there is a problem with my order? Please promptly inspect items upon receipt. We will gladly troubleshoot the problem for you and find the best solution for the issue. We will contact you with instructions once we review your information. Please do not send damaged, defective or wrong merchandise back to us unless instructed to do so by a Christmas Central representative. Non-Returnable Items Unless we made a mistake in your order the following items are non-returnable under any circumstances: Giant Everest trees Grand Teton trees Food items Patio furniture sets Life-Size nativities Clothing Shoes. This listing is currently undergoing maintenance, we apologise for any inconvenience caused. 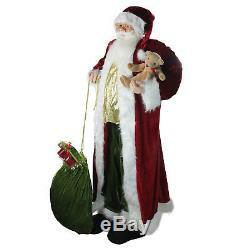 The item "Huge 6' Life-Size Standing Plush Santa Claus Figure with Teddy Bear & Gift Bag" is in sale since Friday, August 31, 2018. This item is in the category "Home & Garden\Holiday & Seasonal Décor\Christmas & Winter\Figurines". The seller is "christmascentral" and is located in Buffalo, New York. This item can be shipped to United States.